Martha Berry asks New York Governor Franklin D. Roosevelt to visit Berry the next time he comes south to visit Warm Springs, reminding him that he promised to visit "when the roads were better." 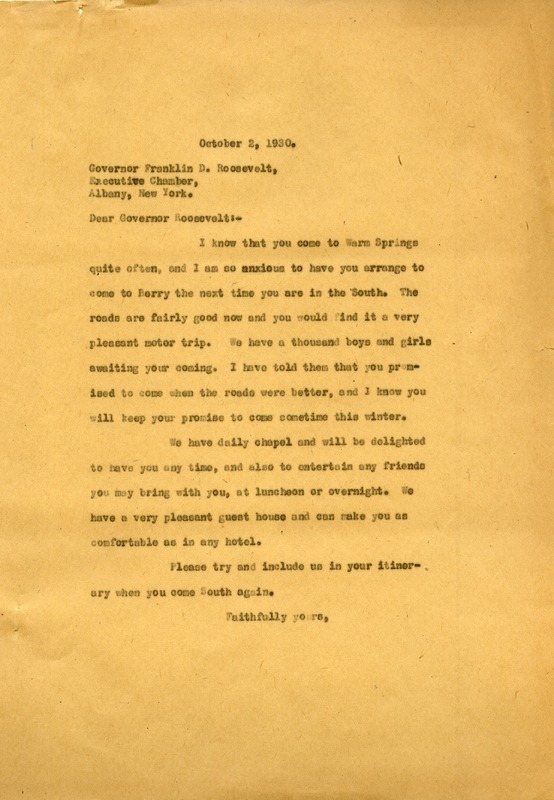 Martha Berry, “Letter to Franklin D. Roosevelt from Martha Berry.” Martha Berry Digital Archive. Eds. Schlitz, Stephanie A., Jordan Brannen, Sherre Harrington, Alan Henderson, Meg Ratliff, et al. Mount Berry: Berry College, 2014. accessed April 24, 2019, https://mbda.berry.edu/items/show/13879.